Availability: In Stock and Shipping Now! 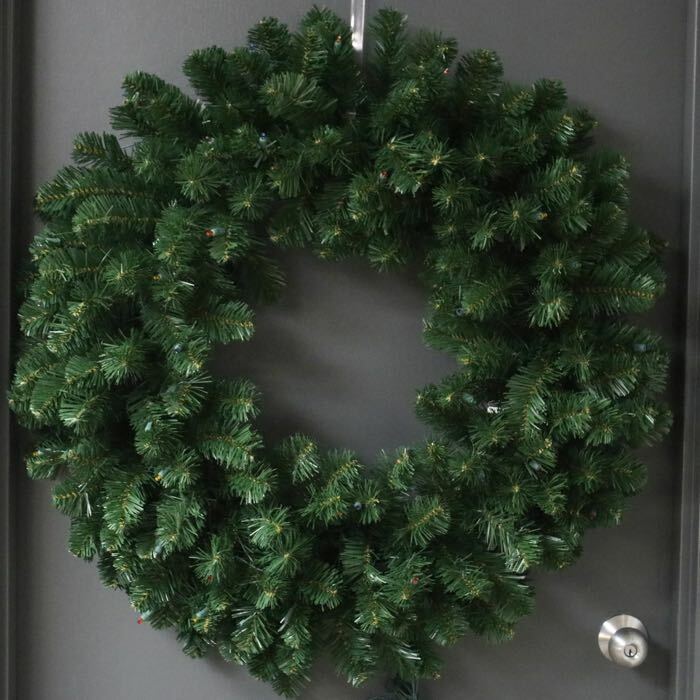 Our pre-lit 70 clear incandescent bulb Christmas Wreath is 36 inches from tip to tip. This means when your wreath arrives it will need to be fluffed. Our wreaths do come packaged compact to prevent damage in shipping. For further clarification: The measurement of 36 inches is from outer reach of the wreath tips to the outer reach of the wreath tips on the other side of the wreath. It is not a measure of the diameter of the internal frame of the wreath. This is an industry standard but we want to make sure that commercial and residential customers alike understand this term. Your wreath will arrive in a "compacted form" and you'll have to fluff it up thoroughly to achieve that tip to tip measurement. Q: Are these pre-lit wreaths plug-in or battery operated? A: These are pre-lit with 120-volt rated lights that plug into a standard outlet.